Where Y is output, K is capital and L is labor. The exponents, α and β, called the output elasticity of capital and labor, respectively, tell us in a very precise way how productive each input is in generating output. A 1% increase in capital increases a firm’s output α%; a 1% increase in labor increases a firm’s output β%. RQ is obtained by expanding the production function to include the two important intangible assets: R&D and advertising. The raw measure for RQ, γ, is the output elasticity of R&D-the percentage increase in revenue the firm gets by increasing its R&D 1%. Thus RQ is simply doing with R&D what everyone has been doing for years with capital and labor. To support intuition, we rescale γ to match the human IQ scale. An RQ of 100 is the average across all US public firms engaged in R&D in the base year. The majority of firms (67%) have RQ's which fall between 85 and 115. Because RQ is based on fundamental economics, it allows us to predict the expected revenues and profits from an increase in R&D. Better still, RQ matches the R&D productivity construct from endogenous growth theory, for which Paul Romer just won the Nobel Prize in Economics. Accordingly, RQ also links R&D spending to firm growth. For more details of its estimation, see the SSRN white paper “A New Measure of Innovation”. Most important of all, these predictions have been validated with 47 years of data as part of two National Science Foundation (NSF) studies. No other measure of R&D productivity matches these predictions. National Science Foundation (NSF) Award Abstract #0965147: "Firm IQ: A Universal, Uniform and Reliable Measure of R&D Effectiveness"
National Science Foundation (NSF) Award Abstract #1246893: "The Impact of R&D Practices on R&D effectiveness (RQ)"
Beyond being validated by the academic and scientific communities, RQ is rapidly gaining widespread attention in the business community. 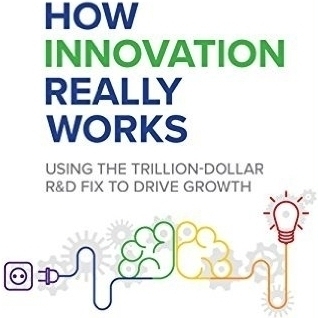 Published by McGraw Hill - Professor Knott's book, describes how to use RQ to determine which R&D investments are most likely to drive growth and debunks innovation trends that don’t work. The CNBC RQ 50 is a unique list of publicly traded companies that derive the greatest shareholder value from their research and development spending. Dr. Anne Marie Knott discusses the applications and implications of RQ for the AMA Edgewise podcast. amkANALYTICS, LLC has a mission to grow the world economy through widespread adoption of RQ metrics and R&D best practices. Professor Knott’s analysis suggests that economic stagnation over the past 40 years stems in part from a 65% decline in companies' RQs. Our hope is that through the R&D manager tools, firms can restore their prior RQs, and advanced economies can begin to enjoy the growth rates from the mid 20th century. Dr. Anne Marie Knott is Professor of Strategy at the Olin School of Business, Washington University, where her principle area of expertise is innovation, both through entrepreneurship and large scale R&D. She has published books and numerous articles on innovation and entrepreneurship, and has received two National Science Foundation grants for her RQ work. Ms. Gannon is a seasoned corporate and start-up executive, with wide ranging experience in corporate strategy, marketing, operations, and systems. She brings significant consulting experience assisting both corporations and startups seeking to launch high tech ventures, including experience as the CEO of Innovate St. Louis, a non-profit which fueled the St. Louis high-tech venture ecosystem. Previously, she co-founded Lendnetwork.com, a venture capital funded auto finance lender which grew to be one of the top three online auto finance platforms prior to selling to E*Trade Bank. She has also led significant systems development efforts and transformative organizational changes at IBM and Solutia. Ms. Gannon holds an M.B.A. from Washington University, Olin School of Business, and a B.A. from Northwestern University.